“The DPRK is an independent socialist state representing the interests of all the Korean people. The Republic is the Juche-oriented socialist state which embodies the idea and leadership of Comrade Kim Il Sung, the founder of the Republic and the father of socialist Korea. His idea and the achievements made under his leadership are the basic guarantee for the Republic’s prosperity. 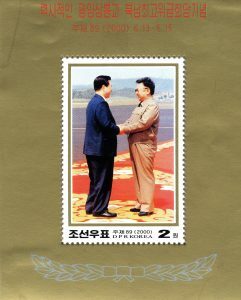 Stamps on view include: Order of the National Flag, 1950; Korean Paintings, 1974; Declaration of Human Rights, 1998 and Anti-Imperalism Posters, 2010. This entry was posted in Announcements, Announcements, Collections, Exhibits & Events, Exhibits & Events, Featured Resources, General Interest, Hay, Josiah Carberry, Special Collections, Spotlights, Uncategorized, Uncategorized by tbowers@brown.edu. Bookmark the permalink.